One of my favorite parts of following local bands is occasionally finding out about incredibly unique events in my city that I would never have otherwise heard of. This is exactly what happened as I was checking up on the kids of Hunter Hunted to see what they were up to these days, and stumbled upon their upcoming tour date at Tarfest. If you have no idea what Tarfest is, don’t worry, you are not alone. I, too, was in the dark about the yearly event held in Los Angeles’ Miracle Mile until recently. But if you’re like me and love eating and drinking while enjoying free art shows and live music, then get your calendar out! This Saturday, September 20th will mark the 12th annual Tarfest, a free music and arts festival hosted by Launch LA and 88.5 FM KCSN with the goal of building relationships between local artists and their communities. This year’s event includes food trucks, a beer garden courtesy of Lagunitas, and a wine bar hosted by neighborhood favorite, Little Bar. Visually inclined attendees will have the opportunity to check out James Griffith’s tar paintings (yes, painting made with tar!) of animals that depict Darwinian evolution and to watch other local artists as they work on their various creations. 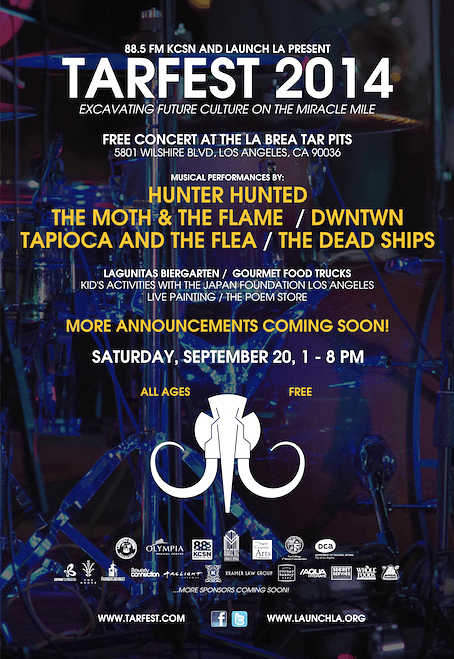 Audiophiles can wander over to the La Brea Tar Pits Park where they can enjoy an awesome lineup of some of Los Angeles’ hottest up-and-coming bands, including a performance by one of my favorite local bands, Hunter Hunted. So, whether you are a foodie, a culture-junkie, or just like hanging out near large ponds of tar, get yourself over to Miracle Mile this Saturday because Tarfest has got your culture fix covered. Easy Garlicky Shrimp Scampi is so good!